To get to this page, go to Settings → Spam Filter → General → Script Configuration. 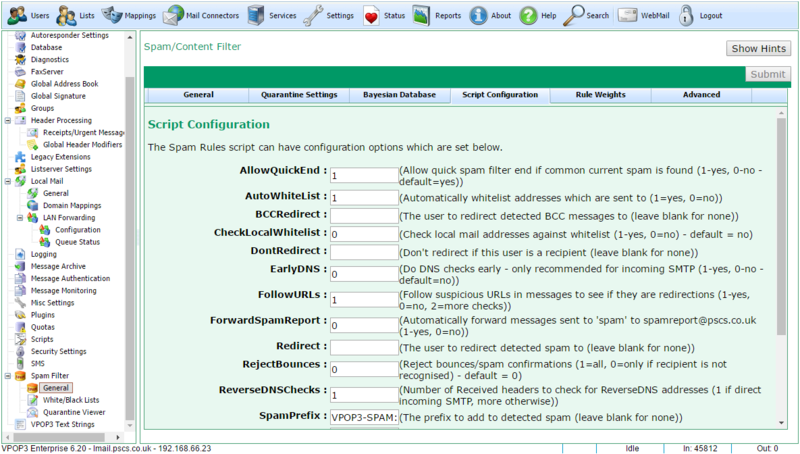 The VPOP3 spam filter behaviour can be customised by an administrator by using various settings. Because the filter can be updated dynamically, either by downloading using a subscription, or by manual editing from the user, these script settings may change over time, so they are listed in this one location. The settings are all text strings inside VPOP3, but the script may require special values, eg '0' or '1' to be meaningful to the script. No checking is performed on the values, so if you enter an invalid value, the behaviour may not be what you expect. To change a settings, simply enter it into the box and press the Submit button. The script settings at the time of writing are listed below with descriptions. As mentioned above these may change over time, or you could add your own settings by writing custom scripts, so the list of options here is not definitive. The spam filter script can take some time to process a message depending on server specification. It performs some checks at the start of the process then the rest of the checks later (eg black/whitelist checks, some current spam attack checks, etc) . If this option is set to '1' then, after the initial set of checks, if the message has been marked as spam, or definitely not spam (eg whitelisted) then the rest of the checks will be skipped. This saves time and reduces load on the server. It does mean that it is slightly more likely to generate false positives, but our tests show this likelihood is minimal. If this option is set, then any BCCd messages that are detected will be redirected to the address specified in this option. Note that detecting BCCs is not guaranteed because there is (by definition) no message header to indicate that a message has been BCCd, but it should work in the vast majority of cases. By default, if an incoming message arrives from an apparently local email address, VPOP3 will NOT check it against the address whitelist. That is because in most cases, messages from local email addresses will be sent via VPOP3 either from local computers or using SMTP authentication. Spammers very often pretend to send mail from local email addresses, so incoming mail from local email addresses should usually be treated with suspicion, not allowed through as whitelisted. In some cases, you may want to receive incoming mail from local email addresses. In that case, change this option to '1', so that VPOP3 will always check the sender against the whitelist, even if the sender appears to be a local email address. This option disables the Redirect option below if the user specified here is a recipient of the incoming message. The VPOP3 spam filter performs lots of DNS queries to look up data in real-time databases of various sorts. DNS queries can take some time to complete, even up to a second or two in some cases, that will slow the spam filtering process down. If EarlyDNS is set to '1', then VPOP3 will issue the DNS queries, then perform a few checks, then check the DNS query results. This increases the overall processing time for checking messages because it may have to wait for DNS results, however this waiting time does not increase server load. Then, VPOP3 may be able to use the DNS query results to decide to 'quickly end' (see AllowQuickEnd above) the filtering process, which will reduce overall server load. If EarlyDNS is set to '0', then VPOP3 will issue the DNS queries, then perform most of the checks, then check the DNS query results.This reduces the overall processing time for checking messages because it will probably not need to wait for the DNS results. VPOP3 cannot use the DNS query results to decide to 'quickly end' the filtering process because the results are checked too late. If you have incoming SMTP, then EarlyDNS should probably be set to '1' to reduce overall server load when handling multiple incoming connections. If you have incoming POP3, then you may want to set it to '0' so that messages are processed more quickly as they arrive sequentially. If this is set to '0' then VPOP3 will do nothing if it sees a URL (link) in a message. If it is set to '1', then VPOP3 will follow some links to see where they go. This can be useful if the email contains URL shorteners. The URL shortener may redirect to a known spam website, so the message can be detected as spam in this case, whereas it can't be detected as spam if the filter just sees the URL shortener address. Also, if VPOP3 downloads the link it can check the page data for spammy data (eg redirects or keywords). The disadvantage is that there is a possibility that by following the URL, it will inform the spammer that the email address is valid. The spam filter will try to reduce this possibility by removing query data etc from the URLs, but it cannot be guaranteed. If this is set to '2', then VPOP3 will follow more links which will increase the likelihood of spam being detected, but may increase the chance of verifying email addresses. We recommend you use '0' or '1' here. If this is set to '1', then if a user forwards a message to 'spam@<your domain>', then VPOP3 will forward a copy to us for analysis. 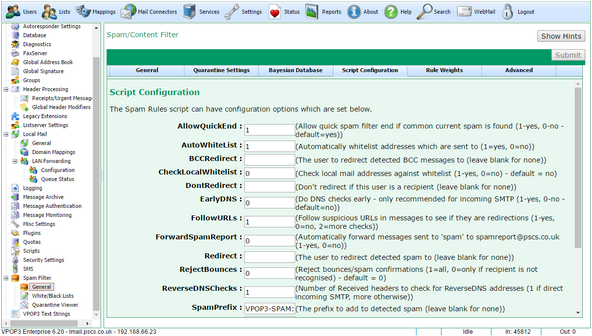 If this is set, then VPOP3 will redirect any detected spam to this address. This may be used as an alternative to (or as well as) the quarantine facility - eg some people redirect spam to a user called 'spambox' which they check periodically in their email client. The disadvantage of doing that is that you need to get any false positives to the original recipient somehow, and forwarding may change reply addresses etc. If this is set to '1', then VPOP3 will treat any message which it can identify as a bounce message as spam. If it is set to '0', then VPOP3 will only treat bounce messages which are for unrecognised recipients as spam. This is a number to say how many IP addresses listed in Received: headers it should check for reverse DNS entries. For direct incoming SMTP this can (and should) be set to '1'. If your mail arrives through your ISP, then you should increase the number so that VPOP3 will check the Received: header just before it arrived at your ISP. This cannot be determined automatically by VPOP3, and will need inspection of the Received: headers to work out how many steps the message goes through at your ISP. It will not cause any problems if this is left as '1', but it means that one particular check won't yield any useful results. This is the spam filter score threshold above which the spam filter will decide the message is spam. This is different from the Quarantine Threshold. The spam filter script runs, assigns a score, and performs some actions based on this threshold (eg adding a subject prefix etc). Then, VPOP3 afterwards decide whether to quarantine the message based on the score, or deliver it, and so on. Quarantine thresholds can be different for each recipient. If this is set to '1', then the VPOP3 spam filter will add incoming messages which are detected as spam to the 'Spam' Bayesian data, or which are not detected as spam to the 'Ham' Bayesian data. If this is '0' then the Bayesian data is not updated automatically at all (but will still be updated for message sent to spam@ or notspam@ or released from quarantine). If this is set to '1' then the VPOP3 spam filter will use the URIBL.COM real-time blacklists. If it is set to '0' then it won't. This option is because URIBL have usage limits for free access, and if you go over the usage limit, they can mark all messages as spam. For the "AutoWhiteList" option, outgoing messages have their recipients added to the whitelist. The WhiteListDomainBlock lets you specify a domain which is not to be added to the whitelist automatically. For the "AutoWhiteList" option, outgoing messages have their recipients added to the whitelist. The WhiteListFromRegExpBlock setting lets you create a regular expression to specify SENDER addresses whose recipients will not be added to the whitelist automatically. This can be useful if you have any software which replies to incoming messages automatically (eg helpdesk software or a customer relationship management system). For the "AutoWhiteList" option, outgoing messages have their recipients added to the whitelist. The WhiteListRegExpBlock settings lets you create a regular expression to specify target addresses which are not to be added to the whitelist automatically.